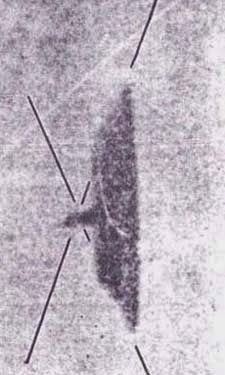 Raumfahrt+Astronomie-Blog von CENAP - Blog: UFO-Forschung - The Trent UFO Photos—‘Best’ of All Time—Finally Busted? 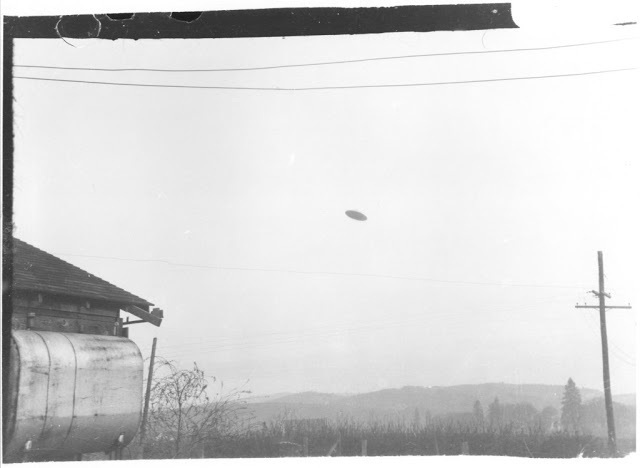 The first of Oregon farmer Paul Trent’s two photos of a supposed “flying saucer,” May 11, 1950. Partly in response to this, I wrote a long special report on the current status of the Trent photos on my BadUFOs blog. Space does not permit putting it in this column, so I include only the highlights here. You can read the long version, and see all the photos, at http://tinyurl.com/BadUFOsTrent. 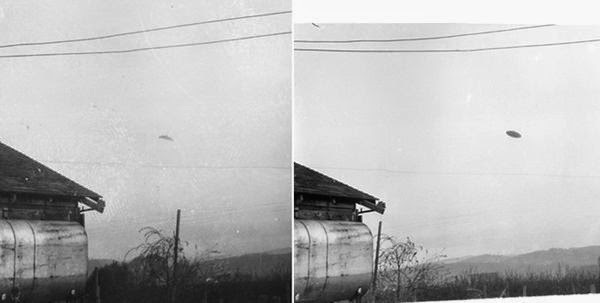 On May 11, 1950, farmer Paul Trent of McMinnville, Oregon, snapped two photos of an object that he claimed was a flying saucer (the term UFO hadn’t been invented yet). There are inconsistencies in Mrs. Trent’s accounts of where her husband was when the object was first spotted and who went inside to get the camera. The Trents did not immediately tell anyone about the photos or rush them off to be developed. 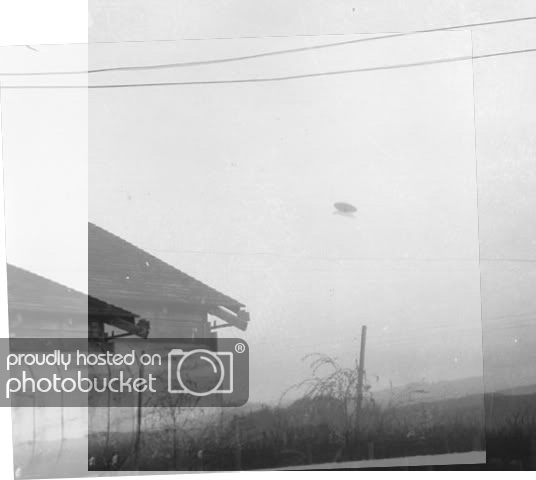 Instead, the film containing the invaluable flying saucer photos was left in the camera until Mother’s Day, so that a few unexposed frames would not be wasted. More general information on the photos is on my website at http://debunker.com/trent.html. The object appears beneath a pair of wires, as is seen in Plates 23 and 24. We may question, therefore, whether it could have been a model suspended from one of the wires. This possibility is strengthened by the observation that the object appears beneath roughly the same point in the two photos, in spite of their having been taken from two positions. • The object is translucent, allowing light from the sky to pass through. • The object has a mirror surface at the bottom, thus we are seeing a reflection of the bright ground and not a shaded surface. There are very distinct shadows on the garage in both photos, although the Trents claimed that the photos were taken around sunset. The problem is that the wall faces east, and the sun is in that position (about 90 degrees azimuth) at about 8:20 am PDT. If the photos were actually taken in the morning, then the Trents were lying about the circumstances of the incident. I found that, measuring the shadows, we can greatly restrict the size of the object casting the shadows. In fact, it is so small that it is almost certainly less than one degree. This eliminates every possible source of illumination except the sun. 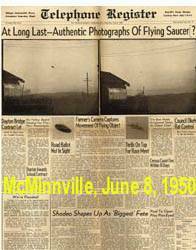 In 2004, researcher Joel Carpenter (1959–2014) created a website on the McMinnville photos, making a very good case that the object was directly beneath the overhead wires and close to the camera. He suggests that the object was a mirror from an old truck. I have restored Joel Carpenter’s original McMinnville photos website (changing only the links), and placed it on the Internet Archive at http://tinyurl.com/CarpenterTrent. 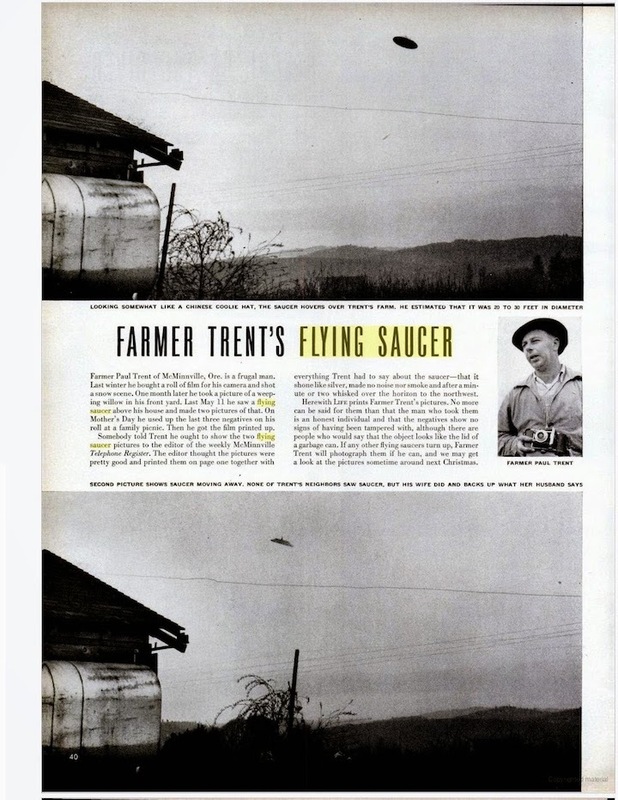 In other words, Trent walked away from where the UFO was supposed to be and instead walked toward where the presumed model was hanging from the wires and crouched down close to the ground to make his “UFO” appear distant. Since the camera moved a significant distance between Photo 1 and Photo 2, can the two Trent photos possibly be viewed as a stereo pair, to reveal the object’s distance? In 2010 an anonymous researcher calling himself Blue Shift did so on Above Top Secret(http://goo.gl/OEsXCi). When you cross your eyes to see the image in 3D, the “UFO” is seen to be small and relatively close to the camera compared with the distant hills. 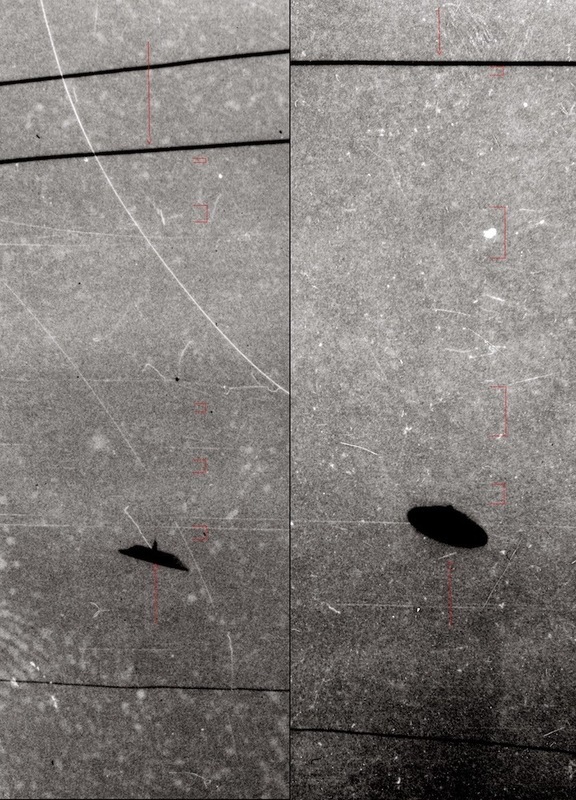 Another way of demonstrating the same thing: a montage by David Slater demonstrates that when the two Trent photos are overlaid so that the wires are lined up, the images of the “UFOs” line up as well (http://goo.gl/5JwJ6e). Both these demonstrations show that the “UFO” appears to be fixed with respect to the overhead wires. In 2013 a group of French skeptics (IPACO) did an in-depth investigation of the McMinnville photos (http://www.ipaco.fr/ReportMcMinnville.pdf). They began with the usual description of the line of sight to the object in each photo, presumed suspension methods, etc. They concluded that the object is a small model. Now, another researcher has weighed in. Jay J. Walter of Phoenix, Arizona, the author of the suspense horror novel Blood Tree, did his own investigation. Working from high-resolution scans of first-generation prints that I sent him (scans I have now posted on the Internet Archive for anyone to research at http://archive.org/details/TrentHighResScans), he did his own photo enhancement using the venerable program ArtGem. He said that even using a 4.2ghz quad core 64bit processor with 8 gigs of system RAM, he was still getting “out of memory” errors. However, he persevered and produced a series of photos appearing to detect portions of a suspension thread above the object in both photos. The purported string cannot be seen across its entire length, which is consistent with the French skeptics being able to detect it only statistically. It is significant that Walter and the French team were working with different scans. 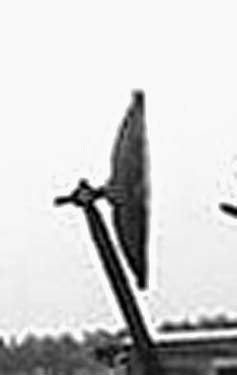 Another of Walter’s purported discoveries is what he calls a “logo,” an apparently flat area with two holes, where it appears a logo plate might be attached or possibly even a handle. Is this real, or is it simply “pareidolia”—seeing a pattern where none exists? Confirmation is needed. Do these new findings finally debunk the Trent photos? They would, provided they can be independently confirmed by other researchers, using other high-resolution scans from first-generation prints or the original negatives. Until then, people will continue to argue about such matters as the gauge of the wires and whether the model, if it was a model, would have to be five or six inches in diameter. Instead of moving toward the object and shooting the photos from eye level in the unobstructed front yard, he shot the two photos up, from a very low level, from the back yard. For reasons explained above, it seems likely that he actually used the viewfinder on the body of the camera while kneeling. 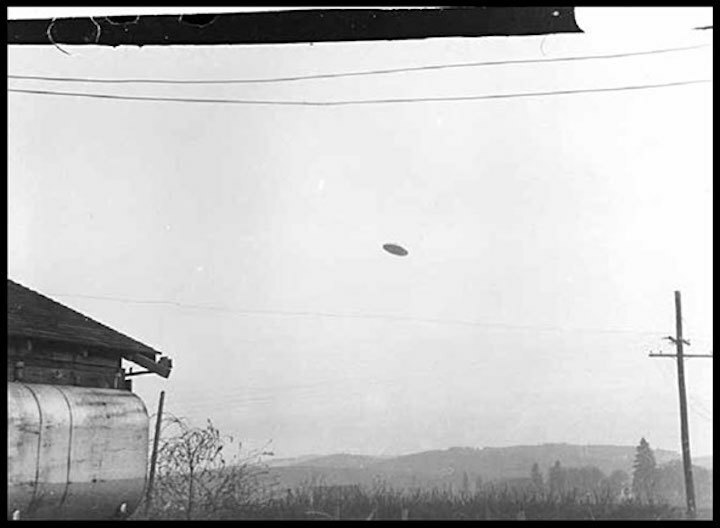 The overall geometry of the positions and the attributes of the camera suggest that he was attempting to frame a nearby object in such a way as to maximize the amount of sky around it and enhance its apparent altitude.In other words, Trent walked away from where the UFO was supposed to be, and instead walked toward where the presumed model was hanging from the wires, and crouched down close to the ground to make his "UFO" appear distant. The basic idea is that if there are traces of a thread in a picture’s pixels, above an object hanging from this thread, and if this trace is « buried in noise » within the sky’s background (noise due to atmospheric diffusion and/or to the digitizing process), it should be possible to increase the signal-to-noise ratio thus uncovering the thread, by summing pixels along columns parallel to the thread.They concluded, "For the TRNT1 picture, the presence of a negative peak (thread darker than the sky) was clearly observed which matched exactly to the supposed attachment point, with a significant difference of 2,38 sigma, for a tilt angle equal to -11°.... Application of the same method to the second picture TRNT2 provided comparable results, with a tilt angle of -10.29 ° and results of over 2.5 sigma."